Law enforcement personnel from the Department of Homeland Security and the U.S. Drug Enforcement Adminstration are in Redwood City Friday morning, according to U.S. Immigration and Customs Enforcement. 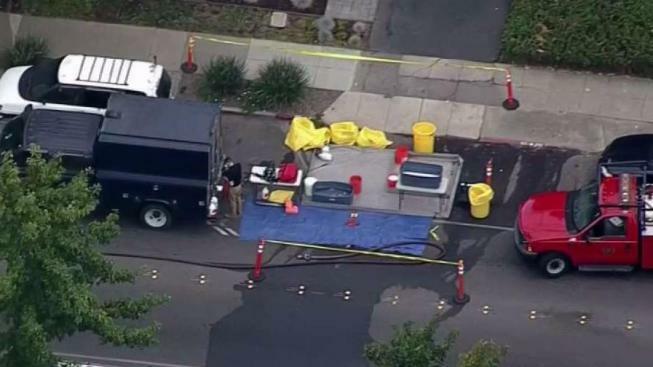 Law enforcement personnel from the Department of Homeland Security and the U.S. Drug Enforcement Administration are in Redwood City Friday morning, according to U.S. Immigration and Customs Enforcement. They arrived at the scene around 8:20 a.m. and closed Whipple Avenue in both directions from El Camino Real to Duane Street. "I’ve never came across anyone who was making the drugs, but this time apparently they’re doing exactly that," said neighbor Bob Bianchi. "There’s a lot of it. I was amazed at how much stuff there was." Bianchi said the building is generally quiet with renters paying between $2,000 and $3,000 each month per unit to live in the high-priced neighborhood. Many members of the public are not aware that ICE engages criminal investigations, according to James Schwab, a spokesman for Homeland Security Investigations. "These guys are going to be a lot more active," he said. "You'll see these guys out quite a bit. They do drugs and child predators — all kinds of stuff." When asked if there was an immigration component involved in this morning's investigation, Schwab said there is not one so far as he is aware. Further details about the case, such as any arrests, were not immediately available.